Contributions are made through Fractured Atlas. Fractured Atlas is a 501(c)(3) public charity. 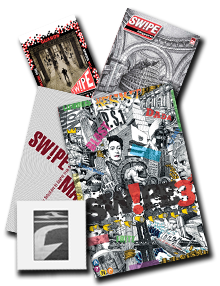 Contributions for the purposes of Swipe Magazine are tax-deductible to the extent permitted by law. The purchase of our magazine and CD will help us spread our message and broaden the exposure of participating artists, writers and musicians. Join the editors of SW!PE Magazine for an evening of music, poetry and entertainment at the amazing Gibson Guitar Showcase from 7 PM until 1 AM. $10 at the door. We will have some food and beverages on hand, but please feel free to BYOB. Check back for further details—or see us on Facebook. SW!PE Magazine was initially conceived as a forum to feature artwork, poetry, literature and criticism from security guards at New York's Metropolitan Museum of Art—since that is where we happened to work at the time. While we are not sanctioned or endorsed in any way by the Museum, we felt there was a need to offer an outlet for the creative potential for those with whom we shared a similar lifestyle. Many of us work long hours in the galleries and have developed intimate and personal relationships with much of the artwork we have been entrusted to protect. We believe our unique position and understanding of our environment gives us an unequaled perspective on the creative process, while allowing us the opportunity to absorb influences not afforded other artists. Our two exhibitions at the 25 CPW Gallery on the Upper West Side in NYC and one at the Spattered Columns Gallery on Broadway in Soho, have also been featured on numerous blogs and have received much praise from those attending. Our plans for the future include expanding the pool of talent to include guards from around the City of New York, to museums throughout the United States and eventually to include representatives from around the world. This is an ambitious goal, and we are well on our way, making connections along the way. Throughout this journey we continue to meet like minded artists and a host of individuals who recognize the importance of our project to give a voice to an often overlooked segment of the art community.